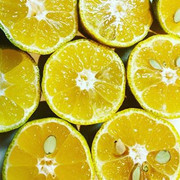 Keraji is a cold hardy Japanese mandarin with yellow-orange skin. The taste is like lemonade and the fruits are small and a bit seedy. Supposedly keraji can handle down to 12 °F. One tree was growing outside unprotected and fruiting in Virginia Beach. Apparently it was a fairly popular tree in the Southeast among those growing cold hardy citrus, but I can't seem to find any nurseries carrying it now. During my research I came across something interesting in a Japanese genetic analysis paper. Seems like keraji shares in common a parent with satsuma mandarin, a type of Japanese tangor called kunenbo which must be confering a degree of exceptional cold hardiness (it's a parent of bloomsweet as well). The analysis actually indicated keraji was probably a backcross of kunenbo with another sour-type citrus known as kubachi (today rather obscure, but the pictures I was able to find look similar to kabosu or sudachi). I just read another research paper DNA analysis that says keraji appears to be a cross between kunenbo (seed parent) and kikai-mikan. I found a picture of kikai-mikan and not surprisingly the fruit looks a lot like a cross between both the pictures of kubachi and kunenbo I saw. So it looks like keraji may indeed be a backcross with kunenbo—that is (kubachi x kunenbo) x kunenbo. I suspect there might be different cultivars of keraji as well, with slightly different qualities when it comes to edibility/flavor, if these plants have been propagated at some point from seed. The seeds seemed pretty big like they would be really easy to grow, so that may be likely. Well that's pretty funny, I start a thread about keraji and show you pictures of its entire lineage of obscure parents but don't show you a picture of keraji itself. Well, there are plenty of pictures of keraji mandarin on the internet so you don't need me to post that there. Does anyone else have keraji seeds to share? I love the fruit. Willing to pay or trade. Looks like I'll be getting keraji too. I'm not sure why you'd want to have keraji. It's not going to be able to survive outside in Kansas, zone 6. And the fruit quality is not going to be anywhere as good as regular mandarins. Keraji might be of more interest to someone in climate zone 8a. I know you're planning to use it in your hybridization attempts, but in zone 6 you may be better off just breeding trifoliate with regular citrus. Keraji doesn't have anywhere near the same cold hardiness as a citrange, for example. I think you wouldn't be bad off just using Satsuma mandarin in your hybridization instead. Keraji is more cold resistant than Morton citrange. > I agree with you about those recessive genes, Walt. I received them as seeds and all the seedling flowered one and half year later. But it doesn't prove it is not recessive because all the seeds could be nucellare. While I am using citranges and citandarins in my breeding Even they must be inside during my winters. Having some mandarins inside to keep me company during the winter is not a problem. None of my citranges are from modern breeding. Having the most hardy mandarines in my breeding populations seems a good idea to me. Crossing the most cold-hardy mandarins available with the rather new, new to me at least, better flavored P. trifoliata is worth doing. They grew from seed fast since they were under optimal growing conditions. I have a Keraji planted outside at a spot close to the greenhouse wall and protected against the Eastern winds that bring the cold snaps of air from Russia. We had a mild winter in December and January followed by a brutally cold week in late February with two nights at -11C (12F) and highs during the day at -6C (21F). The tree survived without damages except a few lost leaves. I wrapped it in frost cloth during the coldest nights. My Ichangquat has no protection against the wind from the East and lost more leaves than the Keraji but still no big damages. Both were planted in 2016 and are about 1.2m (4 ft) tall. Moro, my Ichangquat has a quite big crack in its bark right above the craft union. The Ichangquat is the only one of my outdoor-citri that is not high-crafted. My ichangquat is planted out at the good protected south eastern wall of my house. It took similar temperatures as yours moro. It is untouched and looks in perfect condition. Three meters beside and away of the house. Can anybody say something to the fruit quality of ichangquat? Mine is from eisenhut, not 6-7-2. According the keraji, I have one growing well protected growing together with a thomasville citrangequat at the south western wall of my house. It is highly probable that ichangquat from Eisenhut is the same that is sold by B.Voss by the name 6-7-2. Mine 6-7-2 is a huge tree around 6 meters tall, never protected and never had any damage (planted in 2004). It is flowering in several waves all summer long, fruits are ripening very quickly, in around 3-4 months. The fruit quality is variable, depends on weather and degree of ripeness. It is best to be picked when easily detached from the branch. A flavor is unique, some melange of pine with feijoa; not unpleasant, with small grapefruit-like bitterness. Occasionally fruits are rather dry inside, but mostly the juice is present in sufficient quantity. I like to eat them as such, but they also can be used for marmalade. Concerning Keraji, no protection, no damage this winter as well as the last one. Here is a picture of mine. It is very thorny. Do you think it could be the same as yours? I'm going to plant it at another place where there is more room for it to grow. In its place I will plant a ichangensis x sinensis which seems to be less hardy and probably remains at a smaller size. The leaves look the same. When young the thorns were also present on small branches, now they are mostly on the trunk. My plant was from B.Voss, immature wood grafted on poncirus, first flowering was in 2008. Btw, what was your lowest temperature? And do you also get prolonged frost? For what it's worth, Eisenhut lists two cultivars, the 6-7-2 and another one (their number 245). They told me it is a sister seedling and has not yet fruited. Since original (USDA Florida) 6-7-2 is monoembryonic, its European seedlings should be different from mother plant. Contrary to the original description, my "6-7-2" of B.Voss gives very small number of seeds (1 per ~10 fruits). 1/3 of them contain green embryos, the rest are white. As I remember mine is not 6-7-2, it's the other one with number 245, since 6-7-2 was not available. I have the 245. It had the first two flowers late last autumn, i.e. no fruits because of the start of winter. Don't know whether it will be able to flower this spring after the arctic conditions in February and March. Moro, to which register does "245" refer? USDA-List? Is your plant in opern ground? Or is it potted? The 245 in Eisenhut's list, the 6-7-2 is their 244. What is kubachi? I know Kābuchi カーブチ , which is the name for citrus keraji. Apparently a rare obscure citrus that is very specific to a particular region in Japan. I don't think we know how it originated, though I would guess it's likely descended from either Yuzu or C. taiwanica. All I can tell you is that I was able to find a picture of it on a Japanese site, and it looked very similar to Sudachi and Kabosu (which I'm pretty both originated from hybrid pollination from yuzu). I know Sudachi is pretty cold hardy (maybe not quite as hardy as Yuzu). I read on another site someone was managing to grow it outside near Portland, OR. Yuzu, Sudachi, Kabosu, they were all used in a similar way to lemons in traditional Japanese cuisine.